To start this one off, heat a few tablespoons of olive oil over medium heat. 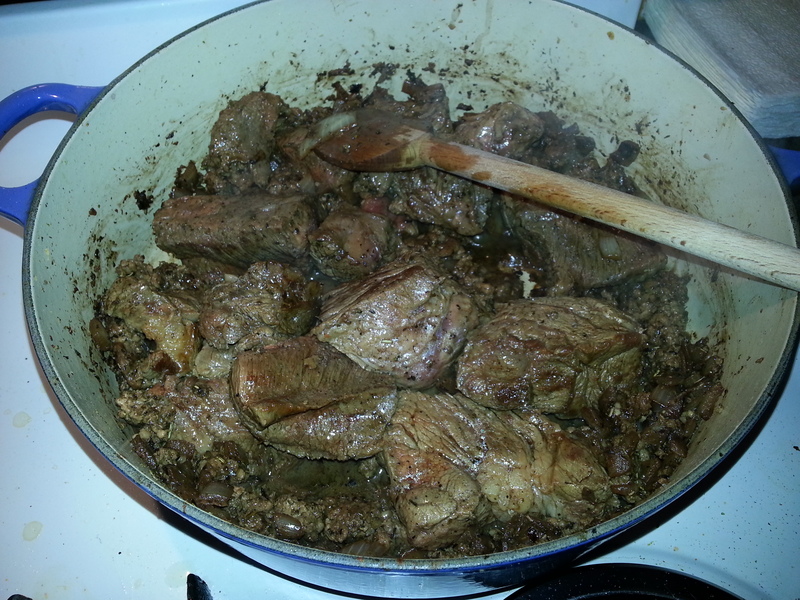 Chop the beef into 1/4 to 1/2 pound chunks, season the meat, and brown the outside. Remove the meat, and add the onions to the pot and stir, cooking until translucent, about three minutes. Add the garlic and spices and cook for another minute, stirring constantly. 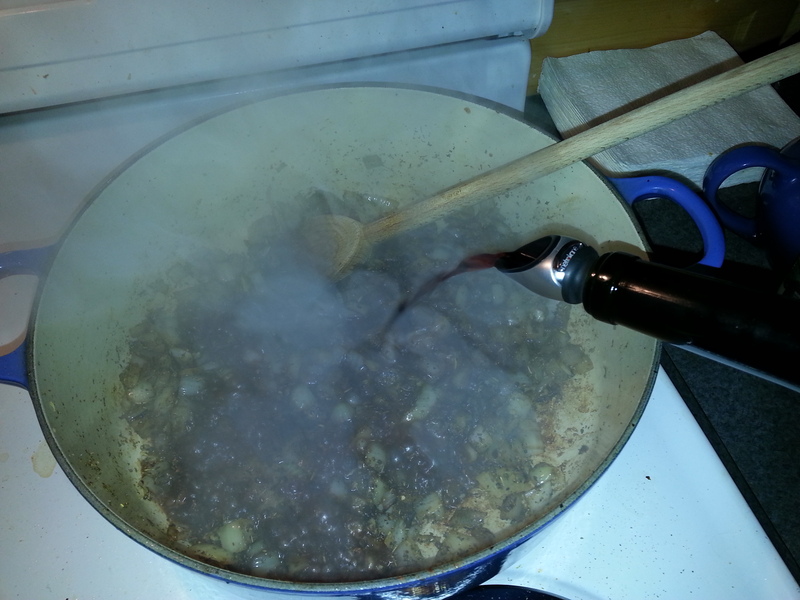 Deglaze the pan – yes, with the onion and garlic still in there – with the wine, and allow it to remove the fond (the stuck-on gunk) from the bottom of the pan by scraping it with a wooden spoon. 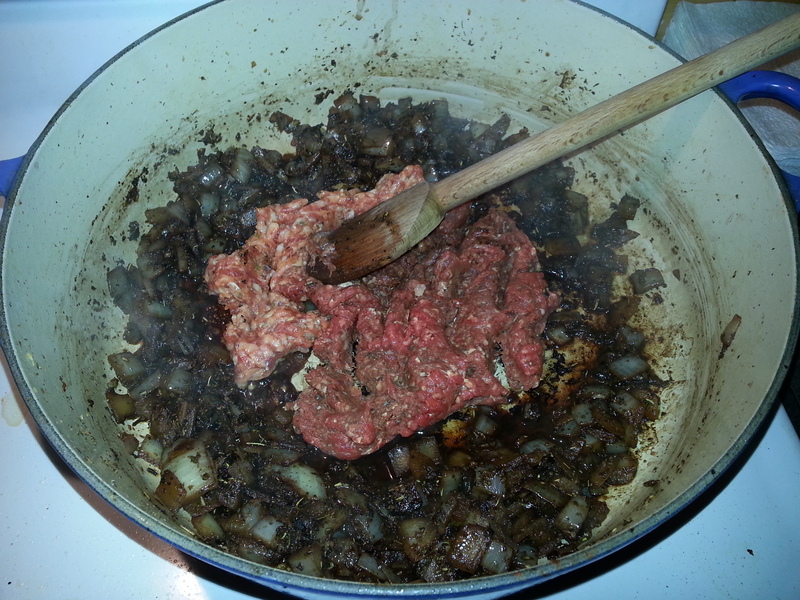 Scoop the onions, garlic and wine mixture to the outside of the pot, and put the sausage and beef into the well to brown. 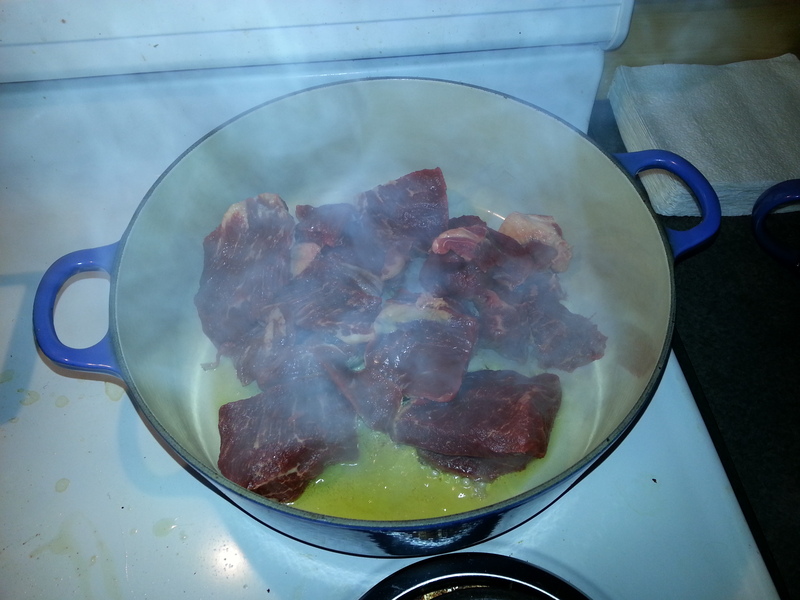 The well allows the meat a more direct heat source. 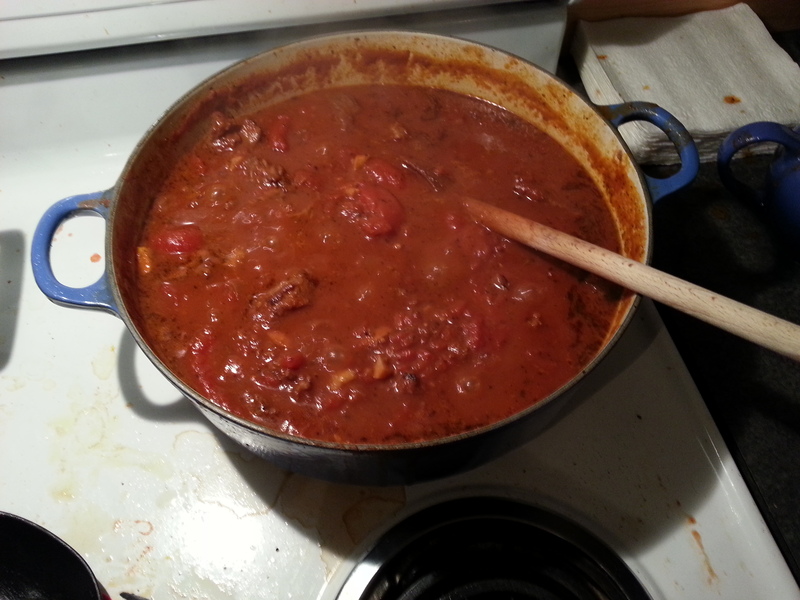 Once you get the ground meat browned – after 5-6 minutes of cooking and stirring – add the beef back into the pot. 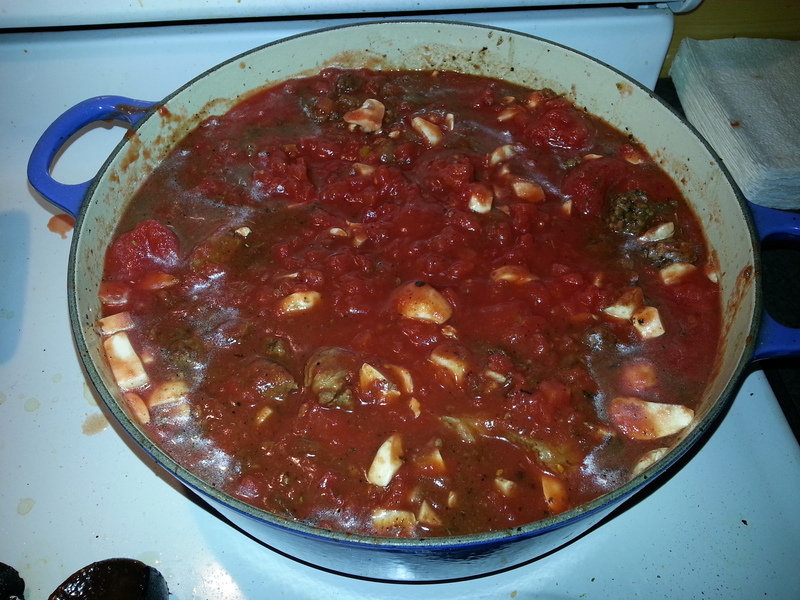 Add the tomato and mushrooms to the mixture and stir. Now it gets easy: cover the pot (perhaps give it a little crack to allow steam to escape), turn the heat to medium-low, and let this bad-boy cook down for four or five hours. Stir the sauce every so often, and use tongs to test the chunks of roast. When the beef is tender – when you’re easily able to pull the meat apart with the tongs – this one is ready to go! My total cooking time for this sauce was about 5 hours, and it was totally worth it. The sauce itself is awesomely meaty, and has a wonderfully rich flavor imparted by the slow-cooked roast. I will be making this one again.